Introduction A novel expandable lumbar interbody fusion cage has been developed which allows for a broad endplate footprint similar to an anterior lumbar interbody fusion (ALIF); however, it is deployed from a minimally invasive transforaminal unilateral approach. The perceived benefit is a stable circumferential fusion from a single approach that maintains the anterior tension band of the anterior longitudinal ligament. The purpose of this biomechanics laboratory study was to evaluate the biomechanical stability of an expandable lumbar interbody cage inserted using a transforaminal approach and deployed in situ compared to a traditional lumbar interbody cage inserted using an anterior approach (control device). Methods Twelve cadaveric spine specimens (L1-L5) were tested intact and after implantation of both the control and experimental devices in two (L2-L3 and L3-L4) segments of each specimen; the assignments of the control and experimental devices to these segments were alternated. Effect of supplemental pedicle screw-rod stabilization was also assessed. Moments were applied to the specimens in flexion-extension (FE), lateral bending (LB), and axial rotation (AR). The effect of physiologic preload on construct stability was evaluated in FE. Segmental motions were measured using an optoelectronic motion measurement system. Results The deployable expendable TLIF cage and control devices significantly reduced FE motion with and without compressive preload when compared to the intact condition (p<0.05). Segmental motions in LB and AR were also significantly reduced with both devices (p<0.05). Under no preload, the deployable expendable TLIF cage construct resulted in significantly smaller FE motion compared to the control cage construct (p<0.01). Under all other testing modes (FE under 400N preload, LB, and AR) the postoperative motions of the two constructs did not differ statistically (p>0.05). Adding bilateral pedicle screws resulted in further reduction of ROM for all loading modes compared to intact condition, with no statistical difference between the two constructs (p>0.05). Conclusions The ability of the deployable expendable interbody cage in reducing segmental motions was equivalent to the control cage when used as a stand-alone construct and also when supplemented with bilateral pedicle screw-rod instrumentation. The larger footprint of the fully deployed TLIF cage combined with preservation of the anterior soft-tissue tension band may provide a better biomechanical fusion environment by combining the advantages of the traditional ALIF and TLIF approaches. There is consensus in the literature that a greater degree of immobilization at the intended fusion levels confers a more ideal environment for boney fusion. Excessive motion interferes with the biologic process of bone healing and results in pseudarthrosis or nonunion.12,13 The mechanical environment conducive to promoting biologic fusion depends on the construct rigidity, which is defined as the ability of the fusion construct to limit intervertebral motion while the segment is subjected to physiologic forces and moments during activities of daily living. In the context of constructs that use interbody spacers such as cages, the construct rigidity, in turn, will depend on the footprint of the interbody cage. Secondly, a larger footprint of the interbody cage will distribute the forces going through the anterior column over a larger area of the vertebral endplates, thereby reducing the likelihood of subsidence while providing a larger space for bone graft placement. The ALIF technique allows the use of an interbody cage with a larger footprint as compared to the traditional PLIF or TLIF cages; however, it requires resection of the anterior tension band (ALL and anterior annulus). TLIF cages can be implanted using a MIS techniques and allow for the retention of the anterior tension band. However, the small window between the exiting and traversing nerve roots limits the footprint size of the cage. Thus, a larger cage footprint and the necessity of disruption of the soft tissue tension band for cage insertion are two competing factors that influence the interbody cage construct rigidity. When posterior decompression surgery is required, the ability to place a cage with a large footprint through a posterior approach may provide an alternative to a “360” surgery necessitating an additional anterior surgical exposure. The purpose of this study was to evaluate the biomechanical stability of a deployable and expandable lumbar interbody cage (Luna 360, Benvenue Medical, Inc., Santa Clara, CA) inserted through a transforaminal approach and deployed in situ to a traditional lumbar interbody cage inserted using an anterior approach (“control” device). Both implants were tested in stand-alone constructs and with the addition of bilateral pedicle screws and rods. Twelve fresh frozen human cadaveric lumbar spine specimens (L1-L5) were used for this study (10 male, 2 female, age 47.5±10.6). Radiographic screening was performed to exclude specimens with fractures, metastatic disease, bridging osteophytes, or other conditions that could affect the biomechanics of the spine. The specimens were thawed and dissected free of their paraspinal musculature while preserving the discs, facet joints, and osteoligamentous structures. The specimens were wrapped in saline soaked gauze to prevent dehydration of the soft tissues. All tests were performed at room temperature. The specimens were fixed to the apparatus at the caudal-most vertebral body (L5) and were free to move in any plane at the cranial end (L1) (Figure 1). Bending moments were applied in flexion-extension and lateral bending by controlling the flow of water into bags attached to loading arms fixed to the L1 vertebra. In axial rotation, pure moment loading was applied by using two bags acting tangentially to a 30 cm diameter disc attached to L1. The apparatus allowed continuous cycling of the specimen between specified maximum moment endpoints in flexion, extension, lateral bending, and axial rotation. The load-displacement data were collected until two reproducible load-displacement loops were obtained. Lumbar spine (L1-L5) experimental set-up showing compressive follower preload cables and guides. The angular motion of the L1 to L5 vertebrae were measured using an optoelectronic motion measurement system (Model Certus, Optotrak, Northern Digital, Waterloo, Ontario). In addition, bi-axial angle sensors (Model 902-45, Applied Geomechanics, Santa Cruz, CA) were mounted on each vertebra to allow real-time feedback for the optimization of the preload path. A six-component load cell (Model MC3A-6-1000, AMTI Multi-component transducers, AMTI Inc., Newton, MA) was placed under the specimen to measure the applied compressive preload and moments. Fluoroscopic imaging (GE OEC 9800 Plus digital fluoroscopy machine) was used to document intact disc heights and implant placement. Thus, 12 segments were implanted with control ALIF cages; six at L2-L3 and six at L3-L4. Similarly, 12 segments were implanted with deployable and expandable cages; six at L2-L3 and six at L3-L4. 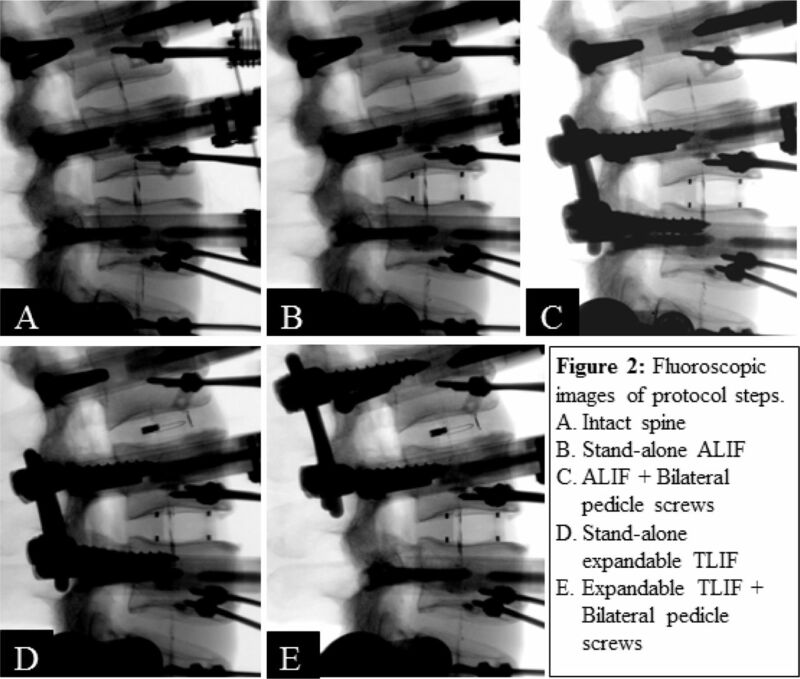 Fluoroscopic images of protocol steps: 1) Intact spine; 2) Stand-alone ALIF 3) ALIF + Bilateral pedicle screws; 4) Stand-alone expandable TLIF; 5)Expandable TLIF + Bilateral pedicle screws. View of inferior endplates and implant placements after sectioning of intervertebral disc. A) Expandable TLIF cage showing the posterior approach. B) ALIF cage showing the anterior approach. The ALIF “control” cage was implanted according to company surgical technique guidelines. A window matching the cage width was made in the anterior annulus and anterior longitudinal ligament. Disc material was removed and the vertebral endplates were prepared in a conventional fashion while preserving their mechanical integrity. Trial sizing aided by fluoroscopy was performed to select the proper cage size. Implantation of a deployable and expandable lumbar interbody fusion device (Luna 360, Benvenue Medical, Inc., Santa Clara, CA), was performed using the standard transforaminal approach. A small window was made in the posterolateral annulus. Disc material was removed to allow sufficient room for the device to be deployed. The device was then deployed in situ to produce its axial footprint, and finally expanded, effectively distracting the intervertebral disc space (Figure 4). Once deployed, the implant presents a graft window that allows bone graft material to be inserted post-expansion; however, no bone graft material was utilized for this biomechanical assessment. Expandable TLIF cage surgical stages. A) interbody cage during deployment, B) cage fully deployed, C) cage expanded. Combined control cage + PS (n=12) vs Combined deployable and expandable cage + PS (n=12). These comparisons were done separately for flexion-extension, lateral bending, and axial rotation, since no comparisons across load-types were intended in the study design. The statistical data analyses performed with use of the Systat 10.2 software package (Systat Software, Richmond, CA). When used as a stand-alone device, the deployable and expandable TLIF cage significantly reduced motion in flexion-extension, from 7.1 ± 1.1 degrees to 3.3 ± 1.3 degrees under no preload, p<0.01, and from 7.1 ± 1.1 degrees to 3.1 ±1.1 degrees under 400N preload, p<0.01 (Table 1). This represents a decrease in sagittal plane motion by 53% and 57%, respectively. The control cage also significantly reduced flexion-extension motion, from 7.4 ± 1.8 degrees to 5.2 ± 1.4 degrees under no preload, p<0.01, and from 7.4 ± 1.6 degrees to 2.9 ±0.8 degrees under 400N preload, p<0.01 (Table 2). This represents a decrease in sagittal plane motion by 28% and 61%, respectively (Figure 5, Figure 6). The difference in the abilities of the deployable and expandable cages and control devices in limiting flexion-extension motion under the preload of 400N was statistically equivalent (57% vs. 61%, p=0.31). However, in the absence of compressive preload, the deployable and expandable TLIF cage was superior in limiting flexion-extension motion (53% vs. 28%, p=0.00). Segmental Range of motion* (Mean ± SD) with (experimental) TLIF cage (degrees). Segmental Range of motion* (Mean ± SD) with (control) ALIF cage (degrees). 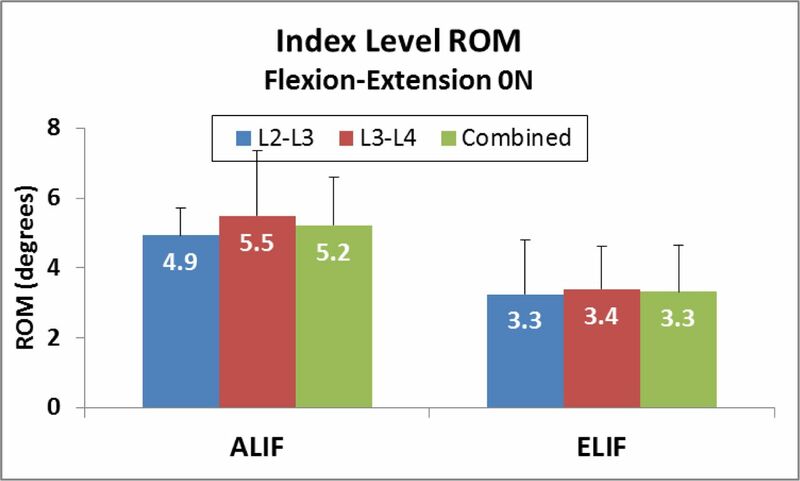 Range of motion of ALIF and the expandable TLIF devices in both implanted segments (L2-L3 and L3-L4) in flexion-extension without preload. 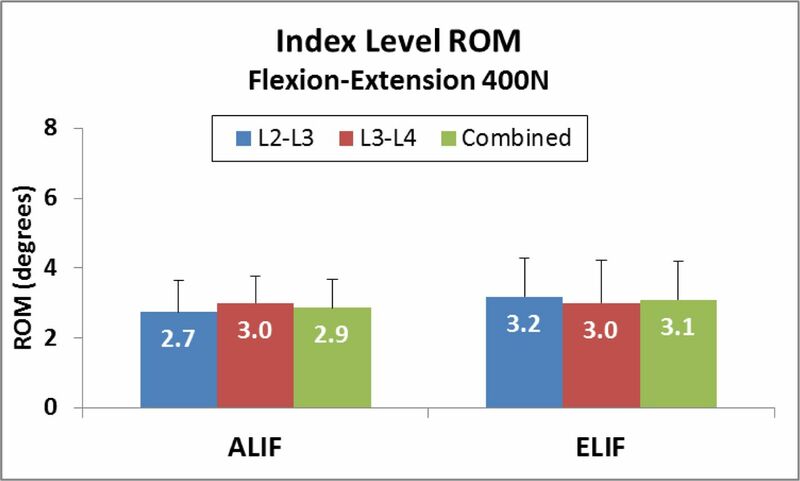 Range of motion of ALIF and the expandable TLIF devices in both implanted segments (L2-L3 and L3-L4) in flexion-extension under 400N follower preload. In lateral bending, the deployable and expandable TLIF cage reduced motion from 8.0 ± 1.5 degrees to 4.1 ± 1.5 degrees, p<0.01. This represents a decrease in coronal plane motion of 50%. The control cage reduced motion from 8.9 ± 1.9 degrees to 3.9 ± 1.7 degrees, p<0.01. This represents a reduction of coronal plane motion of 56.4% (Table 1 & Table 2, Figure 7). There was no statistically significant difference in the abilities of the deployable and expandable cages and control devises in limiting lateral bending motion (50% vs. 56%, p=0.26). 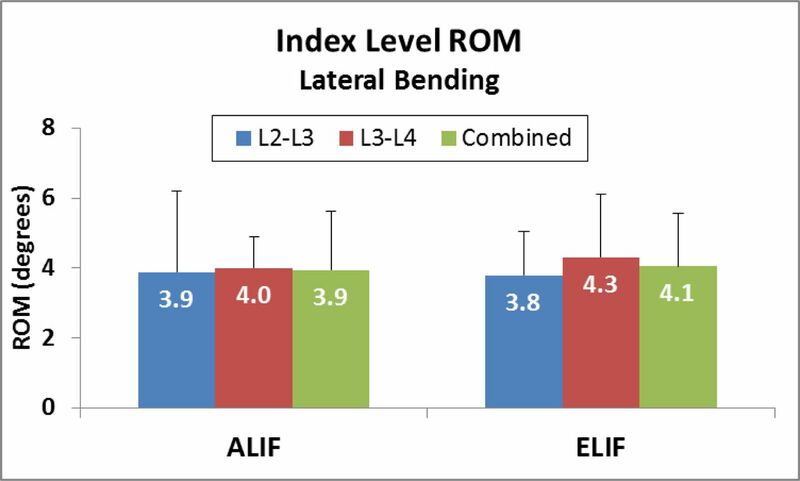 Range of motion of ALIF and expandable TLIF devices in both implanted segments (L2-L3 and L3-L4) in lateral bending. In axial rotation, the deployable and expandable TLIF cage reduced range of motion from 2.4 ± 1.4 degrees to 1.5 ± 0.5 degrees, p<0.05. This represents reduced motion in the axial plane by 21%. The ALIF control cage reduced motion from 2.6 ± 2.1 to 1.6 ±0.9 degrees, p<0.05. This represents reduced motion in the axial plane of 22% (Table 1 & Table 2, Figure 8). The difference in the abilities of the deployable and expandable cages and control devices in limiting axial rotation motion was statistically equivalent (21% vs. 22%, p=0.94). 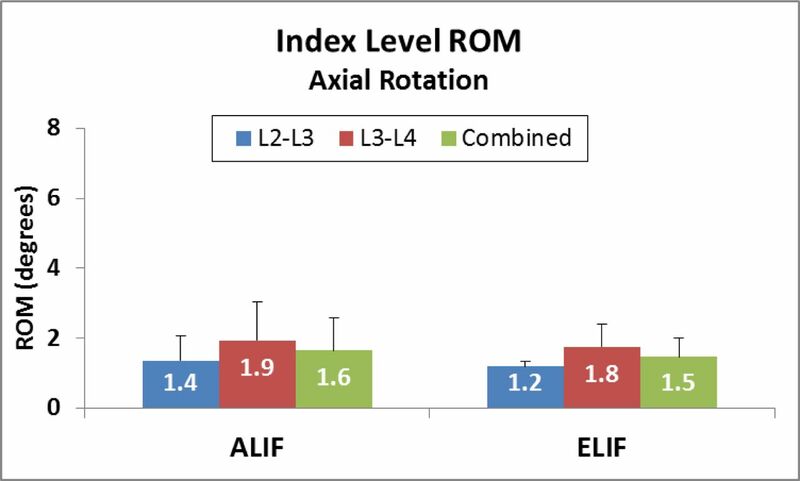 Range of motion of ALIF and expandable TILF devices in both implanted segments (L2-L3 and L3-L4) in axial rotation. Supplemental posterior fixation using bilateral pedicle screws and rods resulted in further reduction in ROM in flexion-extension, lateral bending, and axial rotation (Table 1 & Table 2). The effect of supplemental fixation was significant compared to the stand-alone devices, for both TLIF and ALIF cages (p<0.01). Both devices, when used in conjunction with supplemental fixation, were statistically equivalent in their ability to reduce segmental motion in flexion-extension (p>0.22), lateral bending (p=0.06), and axial rotation (p=0.61). This study compared the relative biomechanical stability between two implants of similar footprint size inserted using two different surgical approaches.2,3 The shape and size of the fully deployed and expanded TLIF cage is very similar to a traditional ALIF cage. 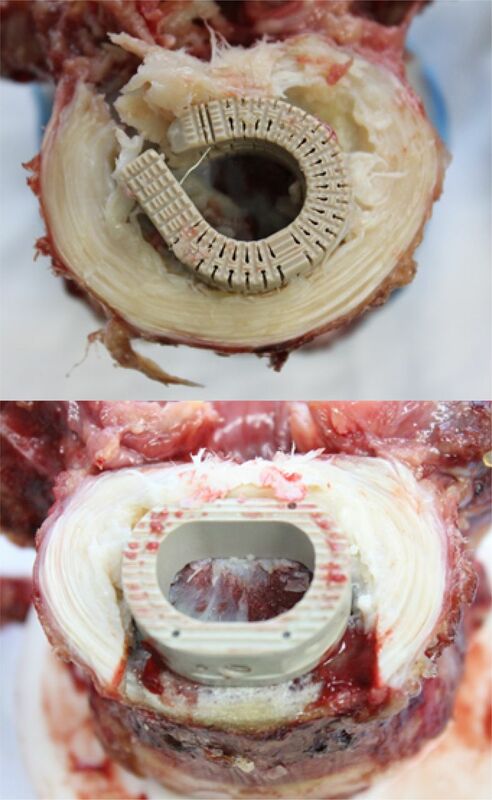 Despite the fact that the anterior longitudinal ligament is removed during ALIF insertion, we chose not to compare to a traditional TLIF cage since the endplate coverage is much smaller than the deployable and expandable Luna cage. Therefore, both deployable and expandable TLIF cage and ALIF cages provide similar surface area for bone graft material, increased stiffness imparted by anterior column support, and the ability to restore sagittal alignment. A deployable and expandable lumbar interbody fusion cage which allows for a single, minimally invasive, posterior approach and annulotomy with intervertebral deployment resulting in a broad-based foot-print may improve outcomes and limit complication. The purpose of this study was to demonstrate biomechanical equivalency of this type of a device to a standard ALIF cage. 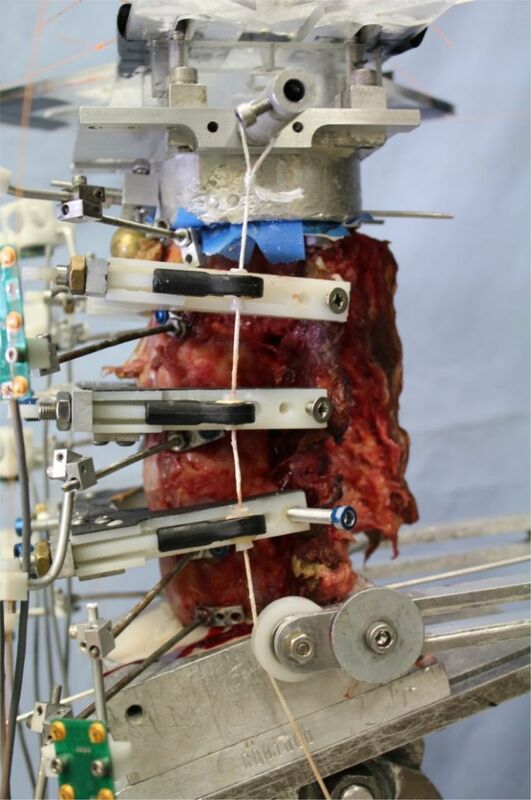 The biomechanical stability of the deployable and expandable TLIF cage was found to be at least equivalent to the ALIF cage, both when used as stand-alone devices as well as when supplemented with bilateral pedicle screw-rod stabilization. Although neither implant is intended to be used as a stand-alone device, both implant types were tested as such in order to elucidate the stability imparted by the interbody device itself, independent of the posterior instrumentation. The in situ expandable nature of the cage after implantation allows for distraction of the disc space without violating endplates during insertion for the same cage size. The two devices significantly reduced segmental motion at the level of implantation and t no statistical difference between the devices in reducing flexion-extension with compressive preload, lateral bending, or axial rotation was observed. Under flexion-extension testing without preload, there was a statistically significant difference between the two devices favoring increased stability of the deployable and expandable TLIF cage. This is attributable to the retention of the anterior tension band and a small annular window of the TLIF approach through which the deployable and expandable device can be inserted prior to in situ expansion. The compressive preload in the lumbar spine is caused by the action of muscles and has been shown to vary from a low value of 200 N during supine and lateral recumbent postures to over 1000 N during standing and walking.22 Therefore, the improved stability of the stand-alone deployable and expandable TLIF cage construct, compared to the stand-alone ALIF cage construct in the absence of a compressive preload may offer improved protection against migration during the low preload activities. As any cadaveric biomechanical investigation, our study has limitations. We compensated for the absence of active muscles by using follower preload (6-9). In this study our implantation levels of L2-L3 and L3-L4 were chosen in order to have similar anatomy (wedge angle, facet angulation) and kinematics at the two implanted levels. Utilizing L4-L5 would have been more clinically relevant but the lordosis and range of motion at L4-L5 is significantly different than at L3-L4. 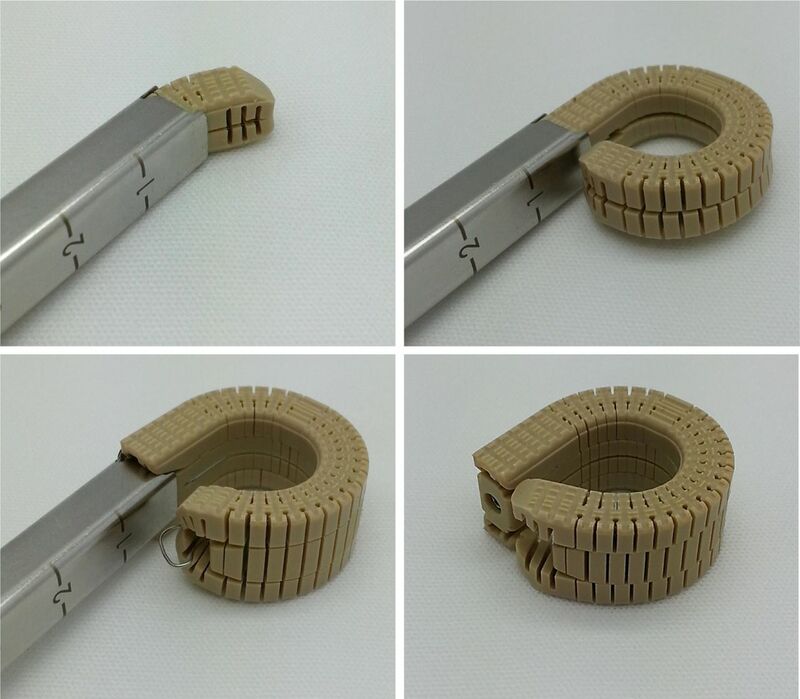 The deployable and expandable Luna cage that can be inserted through TLIF approach with a small annular window and expanded axially in situ has the advantages of a single posterior approach and broad endplate footprint while retaining the anterior tension band for added stability. When compared to an ALIF cage, the deployable and expandable TLIF cage demonstrates biomechanical equivalence in regards to segmental stability in the coronal, sagittal, and axial planes. The effect of this on fusion rate and decreased complications needs to be clinically studied. The deployable and expandable TLIF cage is an improvement over traditional fixed dimension TLIF cages due to the implant’s deployment technology making implantation possible through a narrow surgical corridor resulting in minimal nerve root retraction and tissue dissection. Additional benefits over traditional TLIF designs include a much larger end-plate footprint and the ability to axially expand the device to add annular tension and segmental lordosis. This study was supported by the Department of Veterans Affairs, Washington, DC, and Benvenue Medical, Santa Clara, CA. This study was suppported by the Department of Veterans Affairs, Washington, DC, and Benvenue Medical, Santa Clara, CA. Bartosz Wojewnik, MD, is a consultant for Synthes Spine. (2011) Fusion rates of instrumented lumbar spinal arthrodesis according to surgical approach: a systematic review of randomized trials. Clin Orthop Surg 3:39–47. (Aug 1, 2015) Trends in the surgical treatment of lumbar spine disease in the United States. Spine J 15(8):1719–27. (Feb, 2015) Comparison of the different surgical approaches for lumbar interbody fusion. J Clin Neurosci 22(2):243–51. (Aug, 2013) Indications for anterior lumbar interbody fusion. Orthop Surg 5(3):153–63. (Sep, 2013) Minimally invasive lateral retroperitoneal transpsoas interbody fusion for L4-5 spondylolisthesis: clinical outcomes. J Neurosurg Spine 19(3):314–20, doi:10.3171/2013.6.SPINE1340. Epub 2013 Jul 26. (2009) Extreme lateral in terbody fusion - XLIF. Curr Orthop Pract 20:238–51. (2004) Transforaminal lumbar interbody fusion: the effect of various instrumentation techniques on the flexibility of the lumbar spine. Spine (Phila Pa 1976) 29:E65–E70. (Oct 1, 2013) Adult degenerative scoliosis treated with XLIF: clinical and radiographical results of a prospective multicenter study with 24-month follow-up. Spine (Phila Pa 1976) 38(21):1853–61. (2012) Biomechanics of lateral interbody spacers: going wider for going stiffer. ScientificWorld Journal 2012:381814, doi:10.1100/2012/381814, Epub 2012 Nov 13. (2005) Minimally invasive transforaminal lumbar interbody fusion (TLIF): technical feasibility and initial results. J Spinal Disord Tech 18(suppl 1):S1–S6. (Apr, 2016) MIS Expandable Inter-body Spacers: A Literature Review and Biomechanical Comparison of an Expandable MIS TLIF With Conventional TLIF and ALIF. Spine (Phila Pa 1976) 41(Suppl 8):S44–9. (February 18-22, 1996) (Atlanta, Georgia), 42nd Annual Meeting Orthopaedic Research Society, The effect of the mechanical environment on healing of a lumbar fusion using in an vivo model. (1980) Current Concepts of Internal Fixation of Fractures, The concept of interfragmentary strain (Springer-Verlag, Uhtoff, Berlin). (1999) A Follower Load Increases the Load Carrying Capacity of the Lumbar Spine in Compression. Spine 24(10):1003–9. (Sep, 2003) Compressive preload improves the stability of the anterior lumbar interbody fusion (ALIF) cage construct. J Bone Joint Surg (Am) 85-A(9):1749–56. (2004) Effect of Supplemental Translaminar Facet Screw Fixation on the Stability of Stand-Alone ALIF Cages Under Physiologic Loads. Spine 29:1731–6. (Jan 15, 2008) Enhancing the stability of anterior lumbar interbody fusion: a biomechanical comparison of anterior plate versus posterior transpedicular instrumentation. Spine 33(2):E38–43. (2006) Test Protocols for Evaluation of Spinal Implants. J Bone Joint Surg 88-A(suppl. 2):103–109. (1983) Kinematics and Mechanisms Design (Krieger Publishing Company, Malabar, FL). (2002) Chronic low back pain and fusion: a comparison of three surgical techniques: a prospective multicenter randomized study from the Swedish lumbar spine study group. Spine 27:1131–41. (2001) Mapping the structural properties of the lumbosacral vertebral endplates. Spine 26:889–96. (1960) Lumbar intradiscal pressure. Experimental studies on post-mortem material. Acta Orthop Scand Suppl 43:1–104.